The Arkansas Beekeepers Association will hold its Annual Conference at the Ozark Folk Center, http://www.ozarkfolkcenter.com/, in October. The beautiful Ozark Mountains will be in full fall foliage color, and beekeepers will gather in the town of Mountain View. The beekeepers will hear the latest in honey bee health research. They will purchase bee hives and equipment and renew friendships with fellow beekeepers. They will also enjoy mountain folk music played on the town square during cool fall evenings. 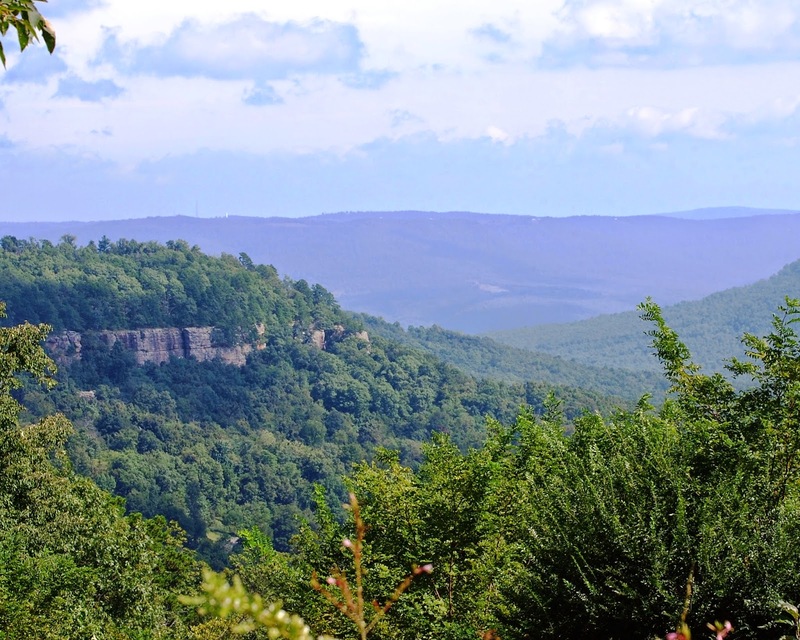 Rita and I have been travelling backroads through the Ozark Mountains exploring the countryside little changed since pioneer family members moved into the Territory of Arkansas in the early nineteenth century. We stopped for hamburgers at the Oark General Store, in continuous operation since 1890. From Oark we travelled to Boxley and Ponca, the elk range along the Buffalo River, http://www.agfc.com/education/Pages/EducationCenterPonca.aspx. Above the river we passed several small groups of bee hives. Bee pollination is important in providing food for wildlife like Arkansas’ elk. Pioneers often kept bees in hollow logs known as gums. They also hunted for feral colonies living in hollow trees, and robbing these trees for honey was an exciting cool-weather tradition. With honey being the only sweetener available, it was a prized commodity often collected in the winter when bee populations were at a minimum. Rita and I found our family cemetery hidden in the woods between Damascus and Center Ridge with its 32 family members’ graves. Only three headstones were engraved, each dated 1861. All other graves were marked by simple slabs of sandstone. For program and information about the Arkansas Beekeepers Association’s meeting in Mountain View, see http://arbeekeepers.org/events.html and http://arbeekeepers.org/docs/2014/ABA%20Fall%202014%20Package.pdf. In today’s photo we see the Ozarks in late summer foliage. When the beekeepers gather in Mountain View, the mountains will be colored with red and purple gums; yellow maples, hickories, and sycamores; green pines; and oaks in many shades of brown. You are welcome to join the Arkansas Beekeepers Association in the Ozarks. Beekeepers gather to share experiences with others who tend to bees, and they attend educational programs to learn from experts in the field of honey bee health. The Arkansas Beekeepers Association will meet in October for its Annual Conference in the beautiful Ozark Mountains of northern Arkansas. The beekeepers will meet fellow beekeepers and honey bee experts and listen to presentations from researchers exploring bee health matters. Among the experts who will be present is Dr. Yu Cheng Zhu of the USDA Agricultural Research Service laboratory in Stoneville, Mississippi. Peace Bee Farm produced bees for Dr. Zhu to use in a study of the effects of exposure to agricultural pesticides on foraging honey bees. 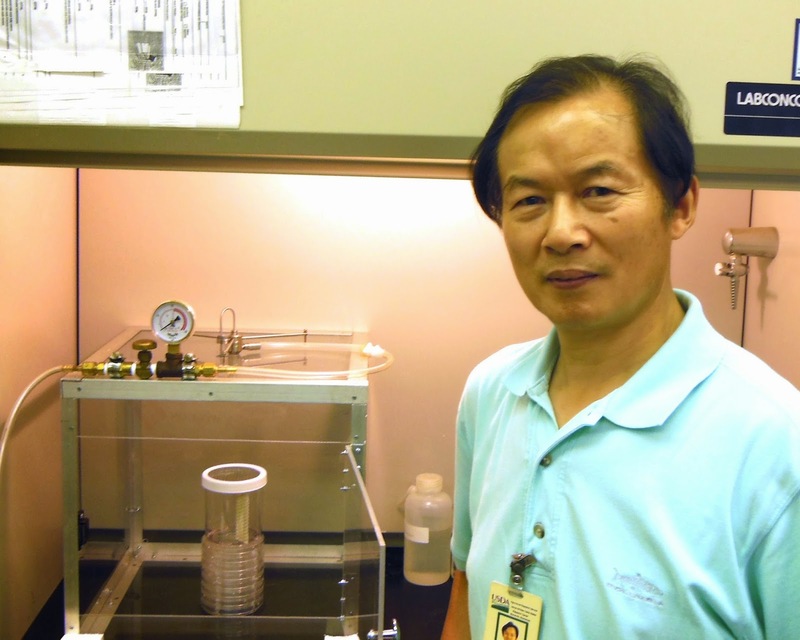 To simulate bees’ being sprayed by an aerosol application of various pesticide products, Dr. Zhu, shown here in his Stoneville laboratory, places bees in a chamber and sprays them with controlled concentrations of pesticides. The bees die within a few days, and researchers analyze proteins in the bees’ bodies. They examine enzymes the honey bees use to detoxify the chemical agents. Some pesticides kill the bees quickly; some kill more slowly; some combinations of chemical agents are toxic; and some pesticide break-down products are highly toxic. Dr. Zhu will present “What you should know about pesticides: Which one is toxic and which one is safe to your honey bees?” at the Arkansas Beekeepers Association’s conference. See arbeekeepers.org for program details. To produce bees of known age, I gathered frames of capped brood from Peace Bee Farm hives. These frames hold pupae, the third stage of developing brood. I held the capped brood in a hive set up as an incubator. This is an arrangement similar to a queen-right queen cell finisher used in queen rearing. The queen is confined in the lowest brood chamber below a queen excluder. The frames of gathered capped brood are placed above the queen excluder. Hive temperature and humidity maintain the larvae in brood nest conditions until needed for the testing.